I am an ardent supporter of the indie music scene—I’d rather support the DIY artist over some giant label any day. So then it should come as no surprise that independent fashion designers also hold a special place in my heart and wardrobe. One of the best places to shop online for independent clothes, shoes and accessories from around the world is Moxsie.com. For fashionistas and style enthusiasts everywhere, unique and up-and-coming indie lines are a good way to find one-of-a-kind pieces that set your look apart. Be sure to check out the classic, delicate jewelry from Meggie. 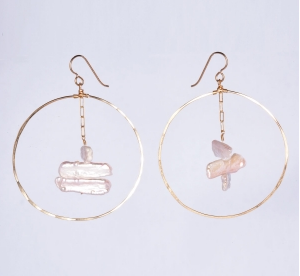 The above hammered, gold-filled hoops accented with freshwater stick pearls are the perfect compliment to your little white dress this summer.